The skies have been constantly gray in Seattle, but summer weather is finally making its way here. 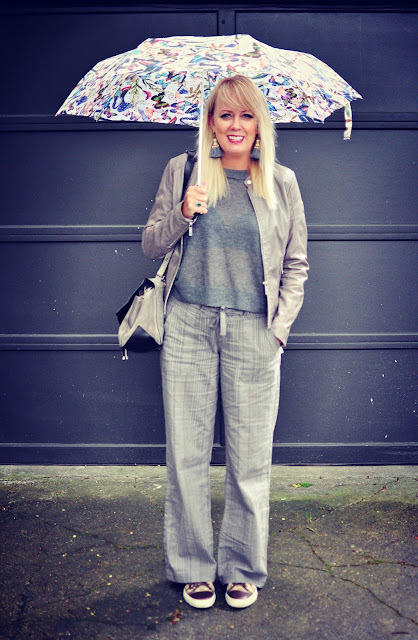 Since gray happens to be my favorite color, I was inspired to wear a monochromatic look that is both casual and chic. What makes the difference between stomping around in a casual outfit and looking pulled together in a low-key way? It is all in the details. It all started with these beautiful earrings I mentioned in the previous blog from The Bluma Project. They arrived in all their tasseled glory and I love them! They are a bold and big, which makes them stand out fabulously. They are now sold out at anthropologie, but you can still find a great selection at Favery. I took a trip to Queen Anne Dispatch in my neighborhood before a recent trip to Hawaii to find some great warm weather pants and ended up purchasing a pair of prAna Steph Pants in a cobblestone (light khaki) color. I loved them so much I went back for the gray pair when I got home! They are a stretch linen blend and have a wide leg, giving them a laid back vibe. The vertical striped pattern and mid rise waist make them super flattering. Love. The pants are a perfect length for my Gucci sneakers. I have the classic women's Gucci GG Logo Brown Leather Sneakers that I bought a few years, and they were a great investment since I have wore them so often. The fashion house is on fire these days, and this pair of Ace Embroidered Low Top Sneakers are a currently a major obsession with the fashion set. Back in February I did a segment on denim for the KING 5 morning program, New Day Northwest, which was a lot of fun! Canopy Blue was kind enough to lend me and my models the clothing for the segment, which was awesome. During the styling at Canopy Blue a couple of days before we were shooting, I fell in love with this beautiful Mauritius lambskin leather jacket in the perfect shade of gray. Because it is always leather weather. Suede is a year round and versatile way to show understated luxury. This Proenza Schouler PS1 gray shoulder bag was in mint condition when I bought it from MB Finds Designer Consignment and it has been without a doubt the perfect spring bag. Of course I treated it with suede protector and I left it home on crazy rainy days, but it has been my go to bag for the past month! 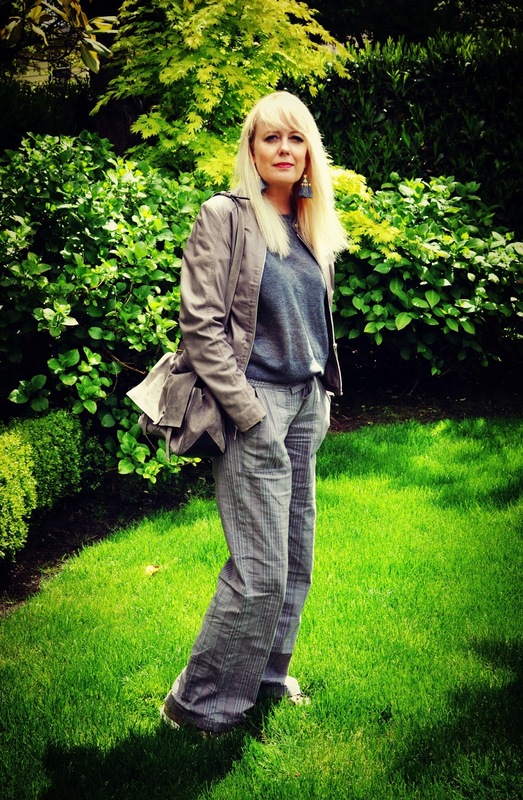 Monochromatic looks are among my favorite ways to dress when I want to look chic, even in summer pants and sneakers. Try an all white ensemble or go for other neutrals to keep things looking streamline and modern.